Allen Organ Studios (AOS) is an authorized representative for all products of the Allen Organ Company. It is our goal to make your buying experience educational and personal. Most organ buyers find purchasing an organ for their church a new experience since most have never served on an organ committee. Our customers are located in central and northern Georgia, eastern Tennessee and include churches, colleges, universities and many residence organs. Purchasing an organ is considered by most a major expenditure. We are certain that our professional approach and knowledge base (since 1958) will make your purchase extremely enjoyable. IT IS AN HONOR to tell you about the staff of AOS. While the music business in general has an enormous flux of personnel, it is rare, but comforting to know that those you have done business with at AOS expect to be there to serve you ‘next time’! Experience is a great teacher as we all know. Within our organization, we share with our customers well over 100 cumulative years of vast organ experiences. Most organists with classical training have been taught to play the notes and most often play the music with registration set up by a the organ instructor (a long time ago). Piano players play musically by adjusting the touch of the key and operating a series of pedals with the feet – producing only piano sounds. Organs on the other hand, are complex instruments and depending on their size can have hundreds of tones (organ voices) to choose from. With couplers and a colorful specification , a single organists can play more notes than a multitude of pianists and produce sounds on the magnitude of a symphony orchestra. So what sounds do you choose for your organ? Simple! Just ask us! For those with organ design experience, the new Allen Quantum and Elite instruments provide an unparallel design possibility and an organ with a unique personal taste that other builders don’t and/or can’t provide. Basic organs usually have stop names that are similar. The smaller organs by feature comparison often appear to be similar, however, there is always a reason for the ‘miracle’ pricing from manufacturers and their representatives! The larger the organ, the additional stop selection is what actually gives the organ its character or flavor. Organs (in some form or fashion) have been around for well over a thousand years. However, today, most classical and theatre organs base their sound on pipe organs (which came long before electronic technology and Allen’s introduction of the first electronic organ patented in 1939). A quick thought about history would ask an interesting question: what if electronic organs were introduced before pipe organs? Well they weren’t, so Allen’s introduction of the world’s first digital musical product patented in 1970 certainly made history and continues to write volumes today. All digital musical manufacturers today flatly are following the leader in the field. Allen has some 20 years of leadership experience more than any other. It will be more decades before we resolve the question of which is better, pipe organ or digital organ. Both sides line up to continually discuss the pros and cons of each product. A profound statement by the legendary Larry Phelps is a constant reminder of progress: “Before the first electronic organ was introduced, all the world’s bad organs were pipe organs!” Organ builders and salesmen constantly try to convince your ears of their pipe like quality. So go listen to a quality pipe organ. The real sound, unique design quality of Allen Quantum technology, along with installations and support by the AOS team will quickly make the sound argument becomes less and less significant. To have the correct harmonics of six complete periods of organ building in one console for the organist’s quick retrieval and use is simply proof of Allen’s constant research, development and leadership in the organ world. Every member of our sales and service staff plays the organ. Designing a specification to work in a given space and provide for your musical needs requires this experience. Fine tonal finishing, adjusting an amplifier,or a tone control board to correct volume levels after service repair or replacement all require this experience. We happen to think you prefer a professional experienced team on your side! Contact us! 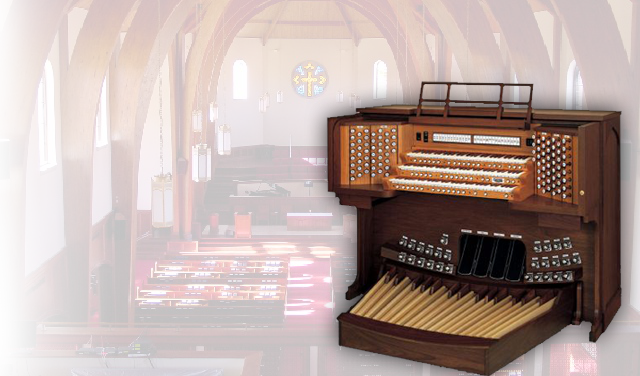 Whether an organ has pipes, speakers or both, the correct placement of all tone producing equipment plays a major role in determining the success of any organ installation. The type of structure to house the organs definitely impacts the final results. Knowing ‘what to do’ and ‘what not to do’ takes equal amounts of knowledge and experience. The type of speakers used in a digital organ and where to put them constitutes approximately 50% of the musical success of the installation. Our staff has placed thousands of audio systems in rooms creating highly successful organs. We design and build our organ cases, speaker support systems, decorative acoustic screens and handle all of our installations in-house. Our beautiful pipe facades are authentic and provide a traditional look that many congregations prefer. Our staff also includes a certified Low Voltage contractor as required by the State of Georgia to insure compliance with the National and State safety laws.